Brendan McCarthy’s family has been involved in Victorian racing and breeding for decades, in administrative roles as well as running a successful stud, and the experienced trainer has carried on the tradition in his own right. 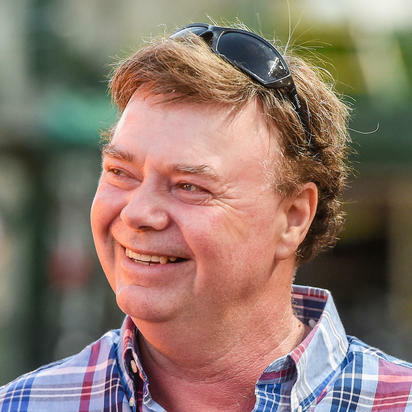 McCarthy, whose father Brendan McCarthy Sr, founded Clearview Park Stud and stood up to six stallions, a foundation that saw Brendan Jr learn all facets of the industry as a child before entering the training ranks as an 18-year-old. He worked with hand-me-down castoffs returned from other trainers and enjoyed success, which cemented his career path that has led Brendan to be a long-time tenant at Caulfield in Melbourne and establish a country training centre at Heath Hill near Pakenham to the east of the city. Brendan, who has had success with homebred horses and relatively inexpensive yearling such as smart three-time Listed-winning sprinter Zedi Knight, arguably best-known for finishing runner-up to champion mare Black Caviar, Listed winner Regal Shot and, more recently speedy stakes-winning filly Blondie. “We have never had expensive horses. We have just gone through with horses like Zedi Knight, who was a $40,000 yearling, and the horses and he would have been one of our top prices,” Brendan said. Zedi Knight won more than $700,000 in prize money. Brendan McCarthy Racing has the best of both worlds, offering metropolitan training at Caulfield with access to top-class grass surfaces and well-maintained dirt surfaces and facilities with access to weekly jump outs. At Brendan McCarthy Racing’s Heath Hill facility, there is room for another 24 horses with an on-property 1500 metre track which has an incline and a horse swimming pool on the farm also recently installed. He has the option of galloping those Heath Hill-based horses at Caulfield for fast work, if he wishes, and can regularly transfer horses to both stables to break up their routine. “Having horses at a city track has always been a big thing for owners,” he said. Training for more than 37 years, Brendan still calls on the experiences of his formative years, particularly the teachings of a respected Argentinian vet Dr Carlos Zathele. “He taught us an enormous amount about the veterinary side of it as well. His father was the leading vet in South America and he was us for all that time. I think it has helped me,” he said. His father also raced horses with well-known trainers Ken Hilton and Brian Courtney and believes he picked up tips about the nuances of training racehorses from the pair as well as other trainers early in his career.